Most of us born and living in Scotland have never had to ask ourselves that question. Not only do we live in a country that has the 6th largest economy in the world but in a welfare state. We have access to clean water from a tap, free education and healthcare. If we want to have a pint in the pub on a Friday, we can. If we want to have bangers and mash on Thursday we can have that. If we want an ice cream on those rare sunny and warm days we can have that. Most of us also know that a large part of the world’s population do not live according to these standards. More surprisingly, as many as 1.2 billion people currently live below the poverty line. That is 20x the entire population of the UK and almost 14% of the world’s population that is living in extreme poverty, surviving on less than £1 a day. To put this in perspective; to afford a small cheese and tomato Domino’s pizza (£7.99), the corner stone of any student diet, 14% of the world would have to starve for 8 days to be able to afford it. How long would you have to starve to afford that pint on a Friday? This summer I am volunteering with the International Citizens Service programme, which is a program designed to give UK volunteers age 18-25 the chance to make an active difference and fight poverty. Since the programme is sponsored by the Department for International Development, all expenses of the volunteers are covered by Westminster to ensure that all who want can participate. I will be working with the UK charity Restless Development in rural Zimbabwe where I will be running workshops on livelihoods and sexual and reproductive health. During this time I will not only teach but also learn about the day to day life in one of the poorest countries in the world, while combating root problems of poverty. As such, I decided to take on the challenge to “Live Below the Line” as part of my fundraising towards the projects in Zimbabwe. I will eat and drink for £1/day for 5 days to fundraise and raise awareness of very real problems, facing very real people. 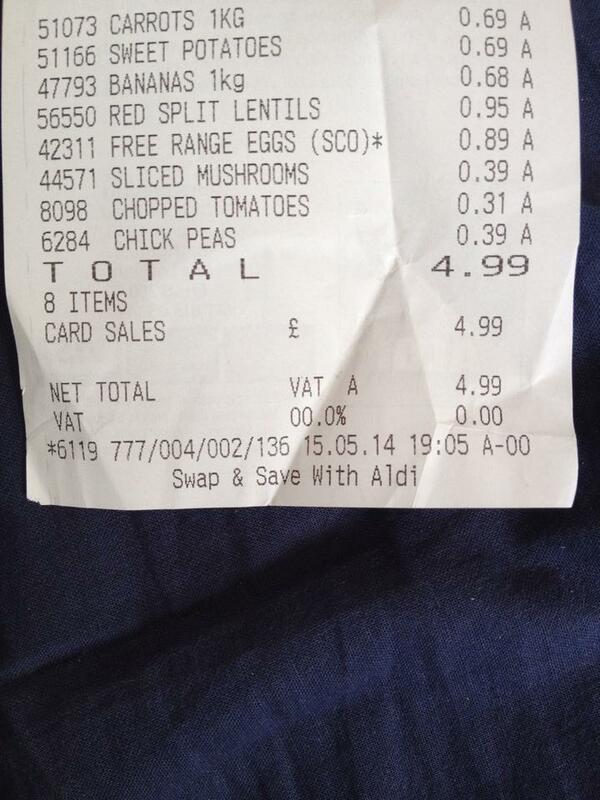 Shopping done – with a penny to spare. I have always used food to spice up my life. If I go traveling I want to treat myself to all the culinary experiences. If I do well on an assignment I can treat myself to an ice cream. If I have revised all day I can treat myself to a tasty meal deal from Sainsbury to avoid the added hassle of cooking. Maybe I’ll even order in. It is almost impossible for me to imagine a life where food is a necessity rather than a luxury, when food is about nothing less than pure survival. What it is like to plan food shopping to make sure that all pennies are put to good use. Or to have to ensure that I use no more than 2dl of oats when making my watery porridge (ugh this will be tough, I hate porridge). 5 days worth of food. If you have £1, £5 or £10 to spare, I would be very thankful if you could donate it to my cause via this website; www.justgiving.com/SupportZimbabwe to help me reach my fundraising target at £800.